We all know AAA gives out sought-after diamond rankings for hotels, and for those in the know in and around Disney’s Hollywood Studios they seek out the Hollywood Tower Hotel, the only hotel to ever receive the prestigious thirteen diamond ranking. While such a ranking has never been bestowed upon an actual hotel with vacancies, it can be found, nonetheless, inside of the Hollywood Tower Hotel, better known as the Tower of Terror. For information on the story of the award, and its place in history, we turn to The Studio Gazette, Volume 1 Number 2, dated for Thursday, September 29, 1994. Just like the tale of the tower, the story of the award blends the line between fact and fiction in a marvelous manner. HEATHROW, FL – In early Autumn of 1939, the Hollywood Tower Hotel was selected by the American Automobile Association to receive the coveted 13 Diamond Award. Since 1902 AAA has rated hotels on cleanliness, value, and quality of service, but the association had never seen fit to bestow its highest honor, the 13 Diamond Award. On October 29, 1939, AAA’s Hotel and Travel Department announced to the public that the Hollywood Tower Hotel would receive the first ever 13 Diamond Award. Two days later, the hotel was struck by lightning, creating one of the greatest mysteries the world had ever known… large sections of the hotel were destroyed and five people simply vanished in a freak elevator accident. The Hollywood Tower Hotel was quickly abandoned and forgotten. The 13 Diamond Award was locked away in storage and quickly forgotten as well. And while AAA continues to rate hotels for the American traveler, no other hotel would ever be listed as an equal to the Hollywood Tower Hotel and thus presented a 13 Diamond Award. 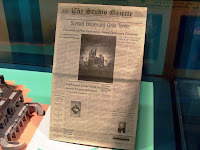 The Hollywood Tower Hotel reopened its doors this past summer as a bizarre attraction for those mystery seekers trying to piece together the events of that strange evening so long ago. Once again this Hollywood landmark is in the spotlight and, with all the media attention, the American Automobile Association has decided to present the 13 Diamond Award to the hotel 55 years after the fateful occurrence. Representatives from AAA will be on hand at the Grand Dedication of the Twilight Zone Tower of Terror to present the award. Thousands of spectators, and honored members of the press are expected to be there to witness this evening’s presentation.